Definitions of autism often evoke the language of disease or abnormality. 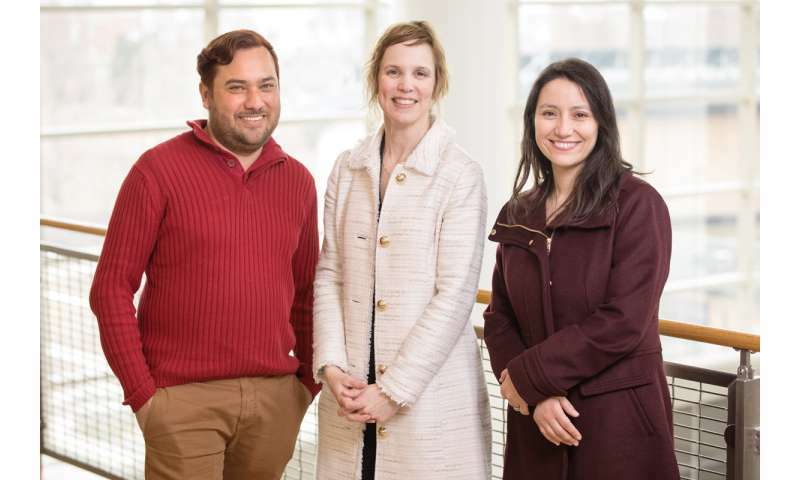 This medicalized approach fails to represent the full diversity of views within the autism community, say U. of I. speech and hearing science professor Laura DeThorne and doctoral students Henry Angulo and Veronica Vidal. In association with April's designation as Autism Awareness Month, DeThorne edited a series of articles on the subject for a publication of the American Speech-Language-Hearing Association. DeThorne and her students spoke to News Bureau life sciences editor Diana Yates about the need to broaden public perceptions of autism. Laura, what do you see as the stereotypes associated with autism? LAURA DETHORNE: When people think of autism, they tend to envision a white male child. While it's true that more males are diagnosed with autism than females, autism crosses gender and racial groups. And given that autism crosses the lifespan, autistic children grow up and become autistic adults. Stereotypic images of autism tend to focus on what an individual supposedly can't do because of autism, such as talk, be empathetic, make friends or live independently. How might such stereotypes be harmful to individuals on the autism spectrum? LD: Individuals who may benefit from an autism diagnosis tend to be overlooked, primarily females and individuals of color. In addition, individuals may resist the diagnosis of autism because it carries such stigma. In particular, I am concerned about the myth that autistic individuals lack empathy. I worry that, as a result, we fail to see them as fully human. This opens the door to a variety of abuses. Attempts to "advocate" or raise money for autism often focus on the negative, contributing to the stigma and fear. I believe this has helped fuel the anti-vaccination movement, which leads some parents to refuse vaccines against life-threatening diseases because they are afraid their child will become autistic. The scientific community may not agree on many things about autism, but there is consensus that vaccines do not cause autism. Finally, framing autism as a tragedy has led to the majority of financial resources being channeled into finding a cure for autism, rather than improving the quality of life for those who currently identify as autistic. What is the neurodiversity movement and how does it fit into this discussion of what autism is? LD: The neurodiversity movement is a grassroots civil rights effort spearheaded largely by autistic individuals and focused on improving the lives of autistic individuals. Proponents tend to view autism as a natural form of human diversity. Autistic brains are viewed as different and not as inherently disordered. I use the adjective "autistic" rather than "person with autism" because it is consistent with the neurodiversity movement, and research findings suggest that it is preferred by a majority of autistic people. The neurodiversity movement also highlights the ways that society contributes to the difficulties of autistic people by devaluing autistic traits and creating environments that do not support autistic brains and bodies. The movement is not inherently opposed to interventions and it acknowledges that certain medical complications such as seizures often accompany autism, causing direct and substantial suffering. But proponents of the neurodiversity movement also see positive aspects of being autistic, such as the ability to focus on specific interests and the joy that can come from repetitive behaviors. The neurodiversity movement has led to the development of important events like Autistic Pride Day and organizations run by autistic people, such as the Autistic Self-Advocacy Network. One of the basic tenets of the neurodiversity movement is "nothing about us without us." This highlights the need for autistic individuals to be directly involved in the decisions that impact their lives. Our set of papers on these issues includes an interview with my colleague Kelly Searsmith, who identifies as autistic. Veronica, you worked with children in Chile as a speech-language pathologist before starting a doctoral program here at Illinois. How do you access the opinions of individuals on the autism spectrum who cannot easily speak for themselves? VERONICA VIDAL: Even when autistic individuals have limited speech, their nonverbal communication is powerful and needs to be taken into account. This can be very challenging for someone who is not familiar with the person, so input from family, friends and trusted communication partners is important. Such people can serve as "cultural brokers" or interpreters. On the topic of interpretation, our research illustrates how clinicians, other professionals and family members can use a strategy called behavioral interpretation to support interactions between autistic and nonautistic peers. Another important form of support for autistic individuals is access to alternative and augmentative communication. AAC ranges from picture symbols to complex speech-generating devices used to support communication. Autistic individuals with limited speech are frequently seen as limited in cognitive abilities, but nonspeaking does not mean nonthinking. Even autistic individuals who speak may find AAC easier to access in times of stress. Providing access to AAC can give many autistic individuals a voice and empower them to express their opinions, preferences and feelings. Henry, how does the neurodiversity movement affect the educational success of autistic individuals? HENRY ANGULO: The neurodiversity movement invites teachers and other important stakeholders to reconsider their narrative about autistic students. This implies, first and foremost, giving up the idea that autistic brains are "deficient," "abnormal" or "broken," and starting to think of autistic brains as "naturally different," with weaknesses and strengths. The neurodiversity movement also reminds us that some barriers to learning are not inherent to the student and/or his autism, but stem from barriers we erect based on assumptions about the homogeneity and neurotypicality of the students in our classrooms. The question to ask is: What am I doing that could be an obstacle to learning, in the design of learning experiences and even in the physical setting of my classroom? For instance, it is important to present information in different formats, given the different ways in which some autistic individuals learn. Integrating visual supports and hands-on tasks are common examples. Finally, from a neurodiversity paradigm perspective, focused interests are viewed as a potential strength, not a symptom, and autistic individuals are encouraged to pursue them rather than suppress them. Studies on the experiences of autistic individuals in higher education highlight that such interests play a very important role in the academic successes and employment opportunities of autistic individuals. In fact, certain companies have started targeting their recruitment campaigns toward autistic individuals based on their specific interests and skills.